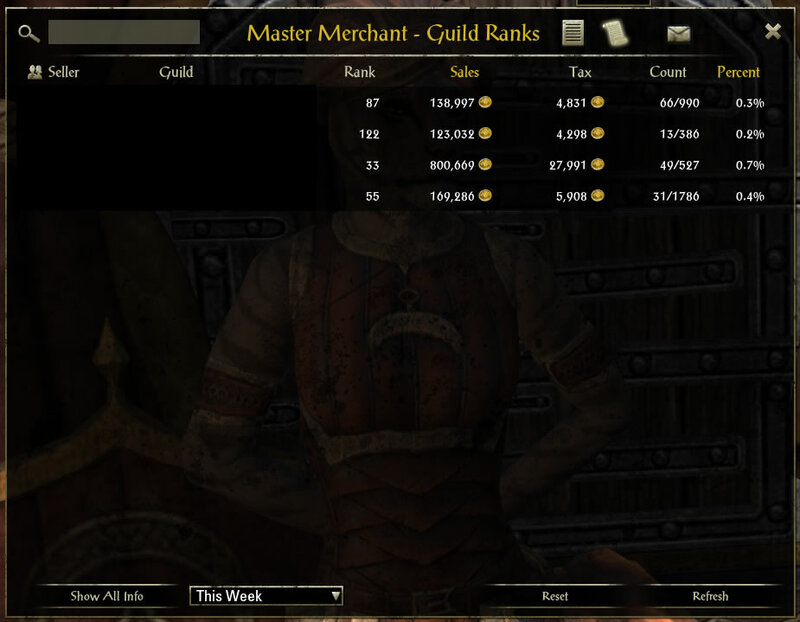 Master Merchant addon can show many helpful numbers and statistics relating to item sales on guild stores. ESO is definitely lacking in ways to grind pure gold or vendor trash. If you hope to make any serious amount of gold you will have to join at least one trading guild. Remember, you can be a member of up to 5 player guilds at the same time. Any trading guild worth a damn will have a weekly sales requirement, and it’s up to you to determine how much you can sell per week. 5k or 10k weekly requirements are very easy to exceed even for newer players. Most 10k guilds will have good guild trader spots every week, enabling you to more easily and quickly sell goods. Majority of gold making tips included in this guide will involve selling items in trading guilds. To be successful in selling items on guild stores, you really should consider installing Master Merchant. This interface addon will show average prices of items on tooltips, enabling you to accurately price items. Prices will be gathered from all sales in guilds you are a member of. See How to install interface addons for help if you need it. 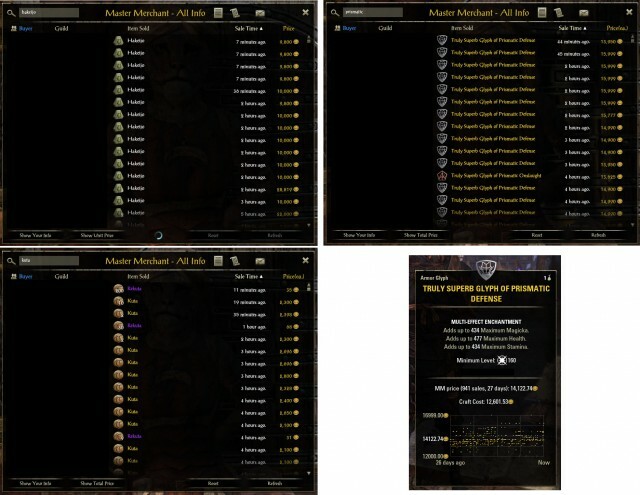 Master Merchant (MM) will also show you sales of everyone else in all guilds you are in. This gives you an easy overview of what players are selling, and if you dig deep enough it can give you even more gold making ideas. There are a few other alternatives to MM. 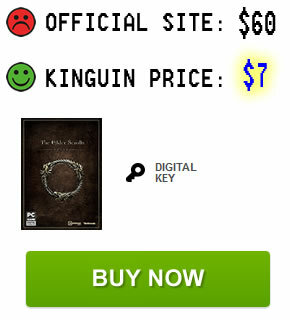 Most common is Tamriel Trade Centre, allowing you to check item prices online. Now, let’s start with some gold making tips! Turning in a daily crafting writ (crafting quest) gives you just over 600g on max level character. With 7 professions this equals over 4,200g each day, per character. This is straight-up gold received for turning in quests, not including other rewards. Survey reports – approximately 2,000g worth of materials from one report. You can expect one a day per character, easily. Legendary upgrade/improvement materials – 2,000g – 8,000g each. Maybe one a week. Ornate and Intricate items – mostly vendor trash, but Jewelry Crafting intricate items can easily be sold on guild stores for a few hundred gold a piece. Other crafting materials – enough to make up for the 200g crafting cost and then some. 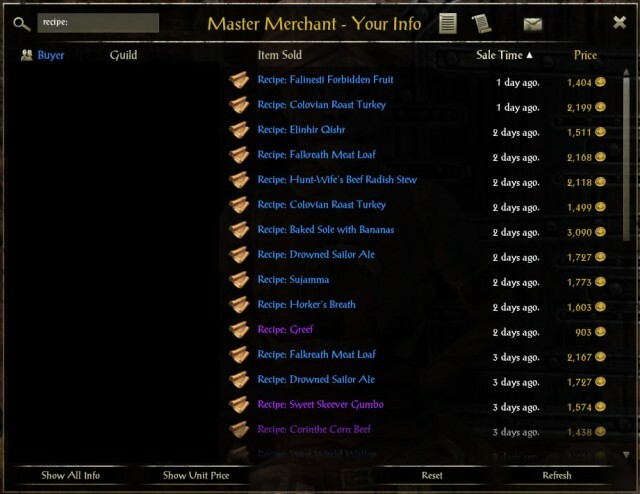 Master Writs – can cost anywhere from 1,500g to over 50,000g. Sadly it requires fully leveled professions, which isn’t always recommended (see below). 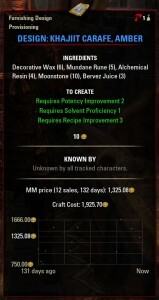 Provisioning Recipes – try to get Provisioning to rank 2 as soon as you can – blue recipes are often worth around 2,000g. With fully leveled professions, this is very common. Right now I have 8 characters doing daily writs. This is 33,600g every day. Including crafting materials and master writs it easily goes over 50,000g daily. To do these dailies on each character takes about 5 minutes: definitely a lot of work, but far simpler than any other gold grind. Tip: to save a ginormous amount of time, get Dolgubon’s Lazy Writ Crafter addon. It enables you to skip dialogue when taking and turning in writ quests, and craft Clothing, Blacksmithing, Jewelry and Woodworking items with literally 1 click. As icing on the cake, this addon will also open containers with materials. Absolute must have, and a huge time saver. Furthermore, as if all the rewards mentioned above weren’t enough, you can also take Hirelings on each character for even more free crafting materials. This makes it easy to self-sustain all crafting efforts without farming additional materials. Another tip: spend 30 Champion Points in Tower tree for 20% increased inspiration gain. Best of all, you don’t have to fully level up most professions. In fact it’s cheaper to do Clothing, Woodworking and Jewelry Crafting with starting materials. Downside is you can’t get Master Writs unless you use highest tier materials. Blacksmithing, Clothing & Woodworking: keep proficiency at lowest rank to use cheapest materials. Eventually, try to level these professions to 32 for rank 3 Hirelings. Jewelry Crafting: keep Engraver at level 1 for cheapest Pewter material, or level anywhere from rank 2-4 to resell mid-level materials. Rank 5 not recommended (Platinum is twice as expensive as Pewter and you need 6 times as much per daily quest; also jewelry master writs are almost always worthless). Provisioning: anything but lowest and highest rank. Mid-level blue and purple recipes are worth 1,500g and more, you will get one every few days on each character. This is more cost-effective compared to getting fairly rare Master Writs. 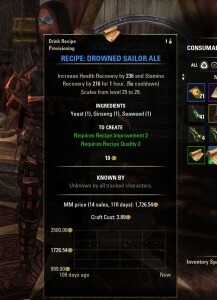 Highest and lowest level recipes are extremely cheap. Any higher but not highest rank is best, allowing high level Hirelings, and points in Chef and Brewer if needed. Alchemy: aim for max level. At least get level 2 as soon as possible: you can sell excess mid-level potion and poison flasks. Enchanting: level up all the way, eventually. Level 32 recommended for rank 3 Hireling. 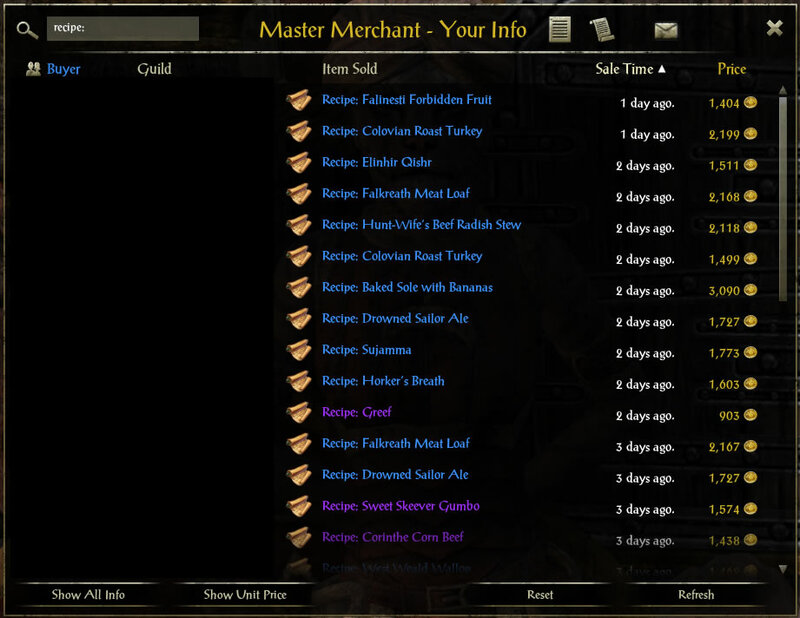 Provisioning recipes sell well, and are more frequent than master writs. Mid-level Provisioning recipes are usually worth 10x more than lowest and highest level ones. Note: you can craft Provisioning and Alchemy stuff with your main character, and use those items to turn in writs on any character on your account. You main character should have points allocated in Alchemy’s Chemistry (produces 3 extra potions or poisons for same amount of materials), and Provisioning’s Chef and Brewer (3 extra food and drink for same amount of materials). This will save you tons of materials and gold. You can also save time by crafting many items in advance. This is particularly useful for Alchemy and Provisioning, since Dolgubon’s Lazy Writ addon doesn’t work with these two professions. Completing a writ with basic materials will give you back 25 Rawhide/Jute, Iron and Maple, much more than you spend. You will also receive 5 Pewter, but will be lacking in runes. However, this is easily negated by the ridiculous number of Survey Reports you will receive with large caches of materials. Last tip: consider doing daily writs in towns with easily accessible crafting stations. My favorite is Rawl’Kha (Reaper’s March). Writ tables and all crafting stations are very near one another, as are stables, bank and Outlaw’s Refuge. Biggest downside to this gold making method is certainly time required to level up alts and gather skill points. Doing a few quests (mainly those which award skill points) and daily dungeon XP rewards should get you to level 50 in a bit over a month. Logging in with several characters every day isn’t very fun either, but it takes five minutes per character at most (don’t forget to train mounts too!). But it’s all worth it. My 8 characters doing writs each day means I get one million (1,008,000g) in pure gold over 30 days without breaking a sweat. This is more than enough that I never even had to consider buying ESO gold. All DLC areas have daily quests which reward motifs. It sounds like obvious advice, but many of these can be very profitable. All three Summerset dailies award Culanda Lacquer style material every time. This sells for 3,000g a pop. This is guaranteed 9,000g per day (and per character, if you wish). Murkmire dailies very often reward Hackwing Plumage (over 1,500g) and Crocodile Leather (200g) style materials. To sweeten the deal, each daily quest completion will also give you over 300g on top of other item rewards. Note: you can initially only do two quests in Summerset or Murkmire. Access to third daily quest is unlocked by completing the zone’s main storyline quest. You can also get daily quests shared by other players, allowing you to complete over a dozen daily quests in Summerset every day (that’s 10+ Lacquers). Motifs from newer DLCs are generally more expensive. It’s highly recommended to start doing daily quests for motifs as soon as possible if you have access to any newly released DLC. 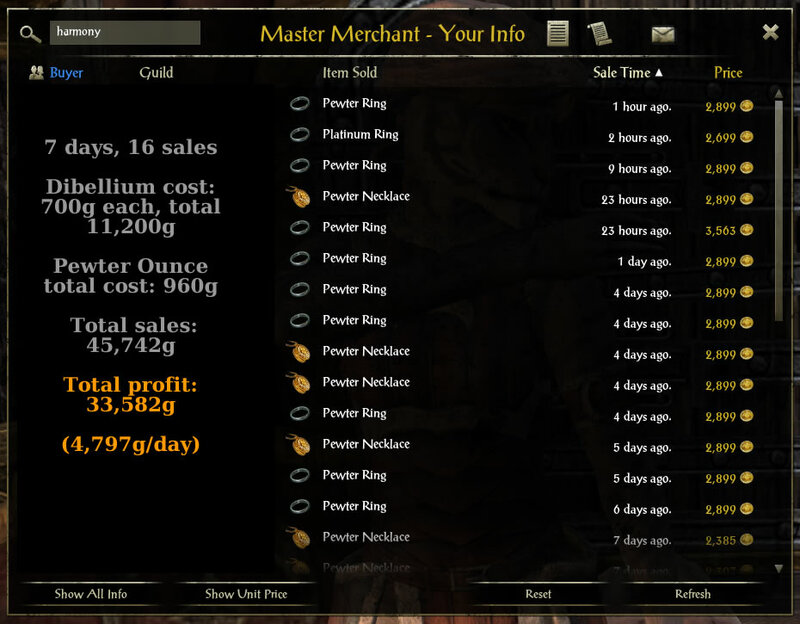 In the first few days prices are insanely high, often reaching over 100,000g per motif page. You wouldn’t expect to be able to buy items from NPC vendors and resell them on guild stores for profit, but you’d be wrong. 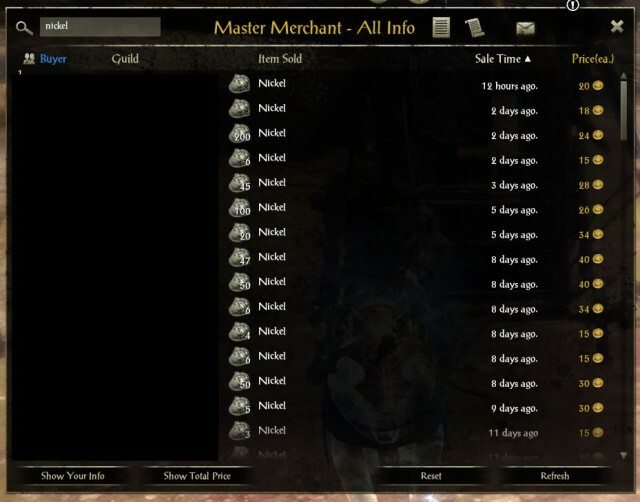 This is possible due to ESO’s fragmented guild stores, as opposed to a server-wide, central auction house. Idode is sold by vendor for 87g, and its average price on guild stores is 300g. All Enchanting vendors will sell you Potency Runestones. These are required for crafting glyphs, but perhaps more importantly players need them for completing daily writs. 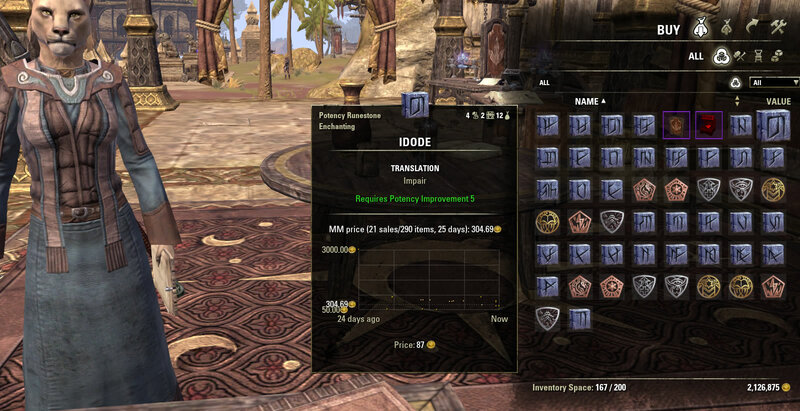 Idode rune as displayed in the screenshot above can be bought for 87g a piece from Enchanter NPCs, while my Master Merchant shows an average price of 300g for each. That’s all nice and good, but does anyone really buy this? 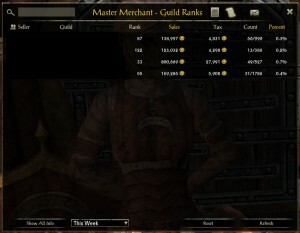 If you have Master Merchant and are in trading guilds, feel free to check sales yourself. Prices may fluctuate and change, but it’s a decent way to make a quick profit every few days. There’s plenty of other Runestones which are worth more on guild stores than vendors, including Derado, Edora, Kura, and Odra, to name a few. Profits are lower for these, but you can still get some nice margins, or more easily reach sales quotas for guild requirements. Hakeijo Essence rune is very rare, and costs around 10,000g. Kuta is around 2,400g. Truly Superb Glyph of Prismatic Defense sells easily for around 15,000g. For a 12,500g cost with quick sales, this is an easy way to make 1,000g or more every day. Notice the time between sales in the image above: these things sell like hotcakes in my guilds. This is also one of the easiest ways to stay in very high gold requirement guilds, and even make additional profit. Very few Blueprints, Patterns, Diagrams, and other Furnishing recipes are sold by vendors. Sometimes you can even resell these on guild stores for profit. 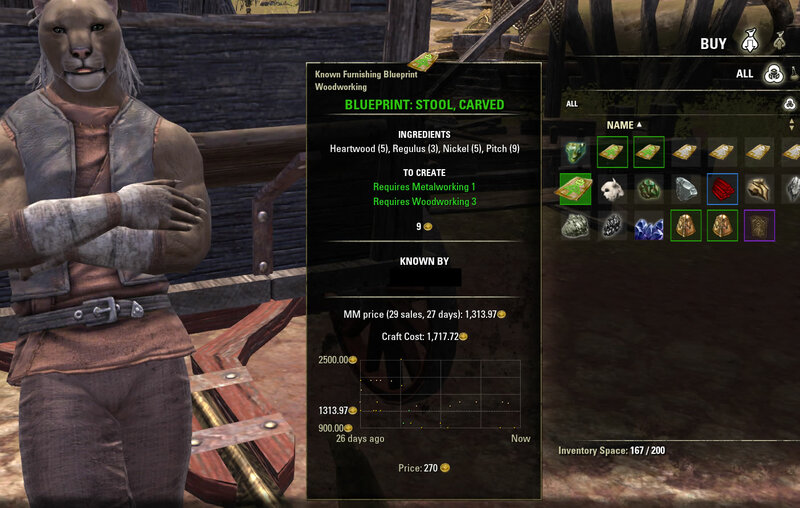 Shown above is Stool, Carved blueprint sold by Woodworking vendors. 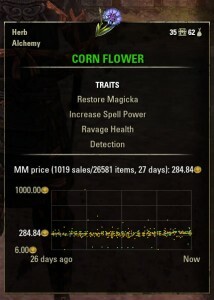 You can see it costs 270g to buy it from vendor, while it sells for 1,500g on my guild stores. Now this most certainly isn’t the way to riches, but if you need to fill those guild slots and get a few extra coins along the way, it can help. There are plenty of other furnishing recipes which can be sold, many with far better profit margins. Some traits are more difficult to obtain than others. As players either deconstruct items or simply don’t want to bother getting them in the first place, a few are priced at a premium. This isn’t a comprehensive list by any means, but it should be more than enough to get you started. Tip: always craft trait research items with the cheapest materials. These are usually the lowest level ones (Jute, Rawhide, Maple, Iron). You can also try your luck selling Nirhoned armor and weapons. You can expect to earn 500-1000g per sale. If you can’t craft it, do the quick research on your alt(s). 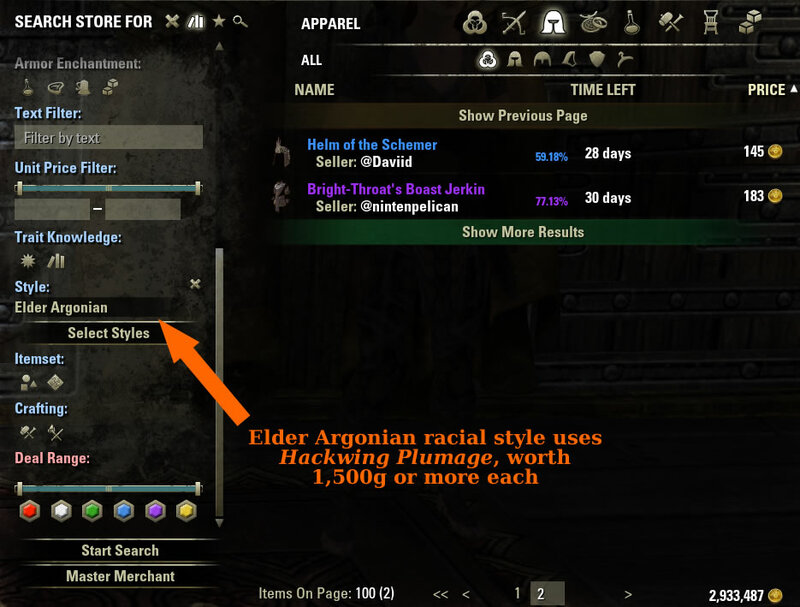 Did you know you can buy basic racial style stones from vendors? These include all the base playable races. All of these style materials can be purchased from vendors for 15g a piece. 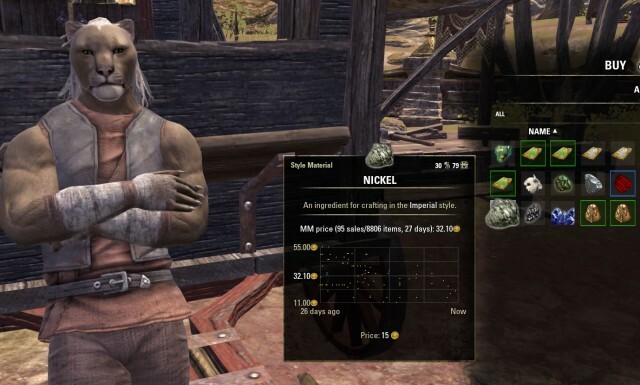 You can buy Nickel and other basic racial style materials from vendors. You’ll notice Nickels often sell for 30g, quickly doubling your investment. Other style materials have smaller profit margins, but can be listed for extra income. Once again, this tip won’t make you rich. But it’s still one of the easiest ways to get an occasional influx of gold. If you have multiple crafting alts, you will be spending a ton of style materials for daily writs. Any style stones for sale on guild traders priced under 15g are worth buying. If you have access to Summerset DLC and therefore Jewelry Crafting, you can make easy gold by crafting jewelry with Harmony and Protective Traits. Crafting a Protective trait requires Titanium, while Harmony requires Dibellium trait material. To craft one ring or necklace you will also need 6 Pewter Ounces (60g total). On guild stores, one Titanium is 600g, and Dibellium 700g. It’s very easy to do the math here. Bloodthirsty and Triune trait jewelry also tends to sell well, as long as you don’t overpay for trait materials. You can expect to sell one jewelry piece every day or two, per guild. Other non-basic jewelry trait materials have higher prices and lower profit margins and aren’t worth buying/crafting for profit. Another Summerset tip is to get the Psijic Order skill line on any characters you travel around with. Psijic Portals are essentially similar in reward values to Treasure Chests. They’re a nice little bonus you will come across fairly often. Psijic Portals are easy to spot, especially in nighttime. If you have multiple characters questing or collecting Survey Reports, you will see them very often. 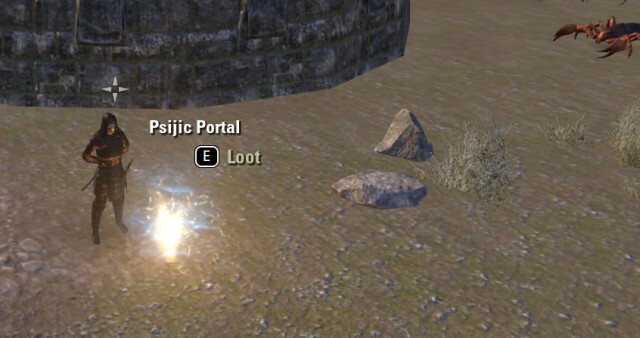 You only need to unlock the Psijic Order skill line in order to be able to see Portals. Fortunately it does not have to be leveled, which is possibly the most disgustingly annoying quest line I ever did. 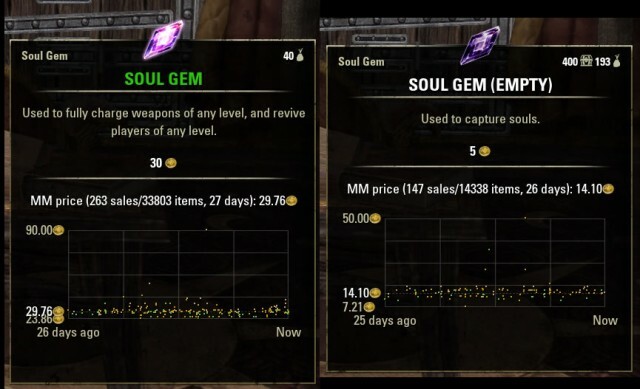 Empty Soul Gems sell on guild stores for 14g each, while filled ones sell for 30g. You can purchase a stack of empty Soul Gems, and fill them all fairly quickly. If you have extra crafting alts, you will also get a few free Empty Soul Gems every day by doing the Enchanter daily writ. You should have a surplus of Soul Gems anyway, but for a quick buck you can very easily purchase more on stores. Easy way to fill many Gems quickly is Baxilt-Gah (Box-Xul map marker) boss in Murkmire. He spawns a ton of skeletons, and you can spam Soul Trap (Soul Magic skill line) on all of them. This method should easily fill 50-70 Gems in a couple of minutes. Including boss respawn time, you can probably fill a stack of gems within 15 minutes, giving you an easy 3,000g profit. Alternatively, you can try Wasp nests in Reaper’s March and Craglorn, Mudcrabs in Fungal Grotto, or simply fill gems while otherwise questing. And because you probably missed it: 30g is the price you can get for a filled Soul Gem by selling to a vendor. You don’t even have to bother listing on guild stores! Check your guilds for filled soul gems too. You can often find players selling them under 30g. Dolmens are a quick and easy method of gaining a few gold pieces for little work. Most of the gold gain from dolmens comes from selling or deconstructing jewelry pieces to obtain improvement grains. If you want to try farming dolmens, you should definitely consider Alik’r Desert. There are large groups of players running them 24/7. Deshaan is best for profits, as CP160 Mother’s Sorrow and Plague Doctor jewelry are both valuable. Geysers are found in Summerset zone. They essentially work the same as dolmens, but have somewhat better rewards. 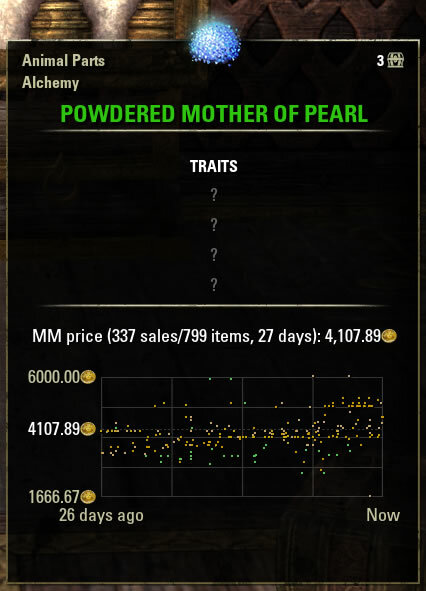 They frequently give you Powdered Mother of Pearl alchemy ingredient, worth 3-4k gold. You can also get plenty of items to sell or deconstruct. For extra profits, use this opportunity to fill some Soul Gems. 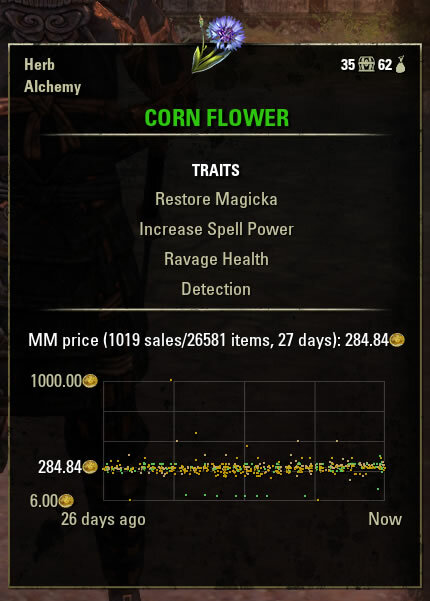 Nearly 300g for a Corn Flower makes it worth stopping and picking up every time. I tend to avoid farming raw materials, as I get more than enough of them from rich nodes from Survey Reports. Normally farming raw mats is too obvious to even mention in a gold making guide, but there are a few tips and tricks I’d like to mention that might maximize your efficiency. First of all I highly recommend 75 Champion Points in The Lover tree. Plentiful Harvest (10 CP required) gives you a 10% chance to receive double materials. 75 points unlock Master Gatherer, reducing your gathering time by 50% (big quality of life improvement). Farming herbs and jewelry dusts is most profitable. Herbs are worth anywhere from 50g to 250g, each. Dusts are worth at least 50g each (raw). Raw clothing, blacksmithing and woodworking materials aren’t lagging behind too much, with prices around 30g a piece. You may want to consider selling all materials in raw, unrefined form, unless you have max points in Refinement for each of these professions (increased chance to get improvement materials when refining raw materials). If you want quick 2-3 thousand gold for 10 minutes of work, simply run around any zone and pick up raw materials. To maximize profits, only pick up Jewelry and Alchemy ingredients. Starter zones are best for finding tons of crafting materials, especially if you want a lengthy farming session. These include Bleakrock Isle (probably best), Khenarthi’s Roost and Stros M’Kai, with Betnikh and Bal’Foyen equally good. Summerset also seems to have a plethora of resource nodes, but can be lacking in jewelry seams. Tip: Steed Mundus gives you 10% movement speed, you can easily switch to it if you plan on farming longer. Rapid Maneuver (Alliance War skill line) is highly recommended at all times, but especially when running around a lot. Farming raw materials is best done in short sessions, and preferably while doing something else, such as waiting for boss spawns. It’s the most consistent way to get fairly high amounts of gold without relying on luck. Stonefalls treasure chests drop Silks of the Sun overland item set. Deshaan gives Mother’s Sorrow items, which are even more valuable. Necropotence set from Rivenspire is somewhere in the middle. Some of these set pieces are cheap, but certain ones with good traits can sell for tens of thousands. Divines trait is usually highly sought after on armor pieces. Keep in mind only items with CP 160 sell, so this gold farming method isn’t feasible for new players. Tip: get Treasure Hunter in The Shadow tree. It requires 75 Champion Points spent, but increases the rarity of items you find in treasure chests. For increased potential profits you can also look into purchasing Treasure Maps in guild stores. Stonefalls and Deshaan treasure maps are more expensive than those for other zones, but it can pay off big time. Many players understandably don’t like delving into the economy too much. Making gold by flipping items (buying and reselling) isn’t everyone’s cup of tea. You can literally flip anything. Whatever you can find underpriced can usually be resold for profit, and the possibilities are endless here. This is why I won’t bother mentioning exactly what to flip, because it doesn’t matter. I’ll just give you some pointers and tips to help get you started. You can buy underpriced raw materials on guild stores and refine them. This requires Refinement skill points in professions to be worth it. Prices of a stack of raw materials are usually around just above the price of one Legendary upgrade material. Each refinement has a 5% chance to give you a Legendary material. This means you should, on average, get your gold back as long as you don’t pay over 40g per raw material. Refined Ruby Ash Wood and Ancestor Silk are 6-8k per stack, so don’t discount the price of refined materials either. An important word of warning first. Style motif pages and books, especially those recently released, are always highly priced. Their prices tend to fall off significantly over time, so I wouldn’t advise buying them unless you can flip quickly. Older motifs with more stable prices can be good buys. In general buying motifs from zone chats can also be lucrative. Players advertising in zone chats are frequently just looking for quick sales and will give them at a discount. It’s imperative to have Master Merchant addon so you can always view prices, trends and sales history at a glance. Good opportunities for reselling newly released motifs are zone chats where they drop in, obviously. Many players are trading more expensive motif pages (typically Chest pieces) for ones they are missing. If you have cheaper motifs, be sure to exchange them for more expensive ones. Just make sure to resell them very quickly before prices fall too much. Items part of Necropotence, Mother’s Sorrow, Plague Doctor, or similar overland item sets tend to sell well. There are frequently large discrepancies in pricing of blue and purple items. You can purchase them with green or blue quality, improve them to purple, and resell for profit. This isn’t something I bother with anymore because they tend to take a week or longer to sell. Having a free listing slot for something else nets me more profit over that time. You can sometimes find extremely cheap items which can be deconstructed into more valuable racial style stones. Elder Argonian is a good example. Murkmire zone and materials have been available for over 3 months at the time of writing this section, so there’s profit to be made for quite awhile. The same principle can be used for any upcoming zones too, so keep an eye out in the future. 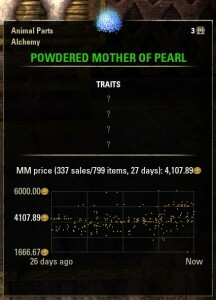 Each Hackwing Plumage (Elder Argonian style material) is worth 1,800g. As you can see they sell very easily. Assuming a very unlucky 20% chance to get a Plumage from deconstructing each item, they would have to be priced at over 300g not to make at least some profit. That doesn’t even take into account blue or purple upgrade materials, and refined materials, both of which can be resold for pretty crazy total profit margins. Obvious tip: search for specific racial style equipment on guild stores in zones they drop in (Hackwing Plumage in Murkmire, Culanda Lacquer in Summerset, etc.). Guilds with Alinor or other Summerset trader locations tend to recruit players in that zone, and increased supply means lower prices. Deal Range search filter can help you find good deals. Easiest way to find various cheap items for flipping is with the Awesome Guild Store addon. You can search an entire guild store for items below their market prices. I highly recommend you avoid flipping items which don’t have at least 10 sales within a month. I personally don’t engage in flipping items, unless it’s particularly easy to resell and highly profitable. My crafting alts easily fill all 30 listing slots in all my trading guilds, and it’s not worth the time or effort to look for additional opportunities. But nevertheless if you’re looking for quick and easy way to make gold in ESO, flipping could be yet another gold making option. Don’t forget to consider guild store deposit and selling fees, especially when flipping. All crafting materials sell very quickly. You can often list them with 5% to 15% of market price, especially with guilds with better trader locations (Mournhold, Skyreach, Evermore, Rawl’Kha, The Hollow City, Elden Root, Alinor). There’s almost never any reason to undercut prices of materials. Players spending thousands or tens of thousands to craft equipment won’t think twice about buying a stack of cloth for 500-1000g more. Any market-priced high level materials will sell within hours for sure. Guilds with not so good trader locations can be equally good for making profit as those with better locations. Don’t underestimate player’s laziness to seek elsewhere. Avoid guilds with Outlaw’s Refuge traders. During special events, items available temporarily (such as various Runeboxes or motifs) very rarely increase in price later on. Sell as soon as you can. Buying or canceling items listed on guild stores returns them to your mailbox. You can quickly refresh your mail by traveling to nearest Outlaw’s Refuge. Faster loading screen compared to changing zones. 8 Legendary improvement materials are required to upgrade items from Epic to Legendary quality. This is why I usually sell these mats in stacks of 9-10. Don’t round up the prices on guild stores. Sell for 9,999g, not 10,000g. 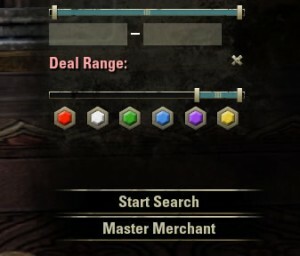 There are many other “generic” ways to get gold in ESO. They aren’t necessarily unprofitable, despite many players engaged in them. If you need to break your usual farming routine or just want to see even more options, here’s a list of other things you could be doing to line your pockets. 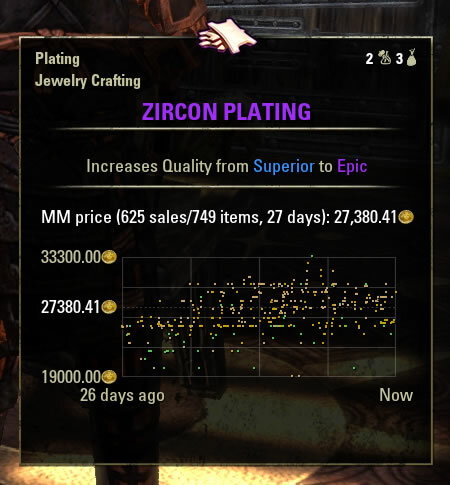 Many zones and instances in ESO can be profitable for stealing. Provisioning materials, and intricate and ornate items can all bring you consistent amounts of gold. Occasional furniture recipe can be worth thousands, and even millions of gold in some rare cases. A few good places to get you started with stealing and pickpocketing are Rawl’Kha (Reaper’s March), Vvardenfell’s Gnisis, Balmora and Vivec, Vulkhel Guard (Auridon), Daggerafall (Glenumbra), Davon’s Watch (Stonefalls), and many more. You can’t get a bounty while stealing in Coldharbour, making it a very attractive zone for illegal activities. 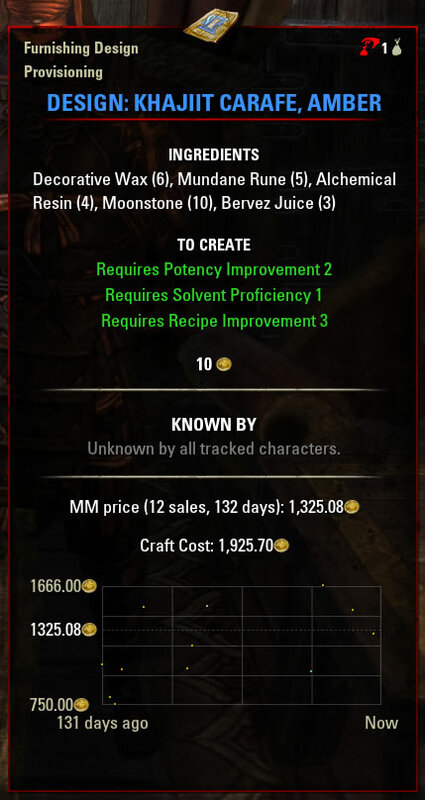 Materials required for provisioning recipes are most easily gathered from delves. Monsters are easy to kill, and many delves have countless sacks, crates, barrels and baskets you can ransack for materials. You can easily expect 6-10g per each ingredient. 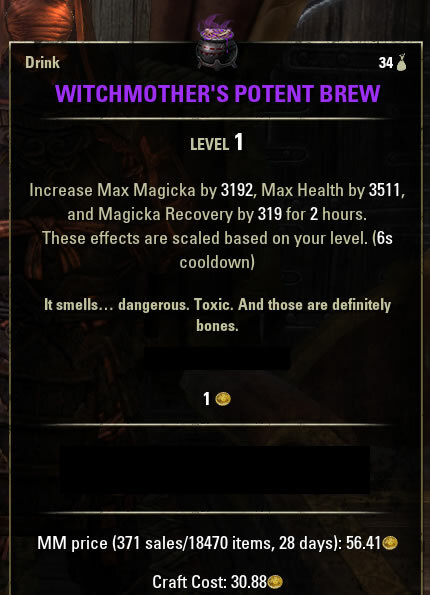 Witchmother’s Potent Brew: craft cost 31g, sells for 56g. Consider crafting Witchmother’s Potent Brew (cheap recipe), Dubious Camoran Throne, or any other highly sought after food or drink for even more profit. You can always choose to buy ESO gold for Crowns if you have very little time to play or no desire to sell items on guild stores. But before you buy gold, make sure you don’t simply waste it if not necessary. Here’s a few tips to help you save gold! Whenever possible try to travel to the nearest Wayshrine before teleporting to another. This makes teleporting free. But, sometimes it’s better to shave off a minute or two and spend that 146g. You can also open your guild roster, and right-click on any player to teleport to them for free. Saves lots of time and gold. Sell recipes or patterns worth over 1,000g, unless you’re a completionist and simply must have them all. Blue and purple recipes sell very quickly. Sell most white/green quality items to vendors. It’s more cost-effective to purchase Intricate items from guild stores if you need to powerlevel your professions. Alternatively, deconstruct cheapest 28g items (belts, gloves) and vendor more expensive ones (2-hand weapons especially). That being said, deconstruct green and purple Woodworking items. Pitch and Mastic are, for whatever reason, very expensive. Don’t repair items while leveling. You will replace them faster than they lose durability. Except for learning purposes, don’t upgrade item quality while leveling either. Waste of gold for very little benefit. Try not to refine too many raw materials unless you have points in Unraveling or Metal/Wood/Jewelry Extraction. If you look like a clown, you can apply item visuals in any Outfit Station, or equip a costume. You don’t have to spend any gold for crafting new items. Basic racial motif books are only a few hundred gold each. Upgrade your character inventory whenever you can afford it. More items picked up means less time wasted traveling to vendors, and more items picked up for said vendors. Daily dungeon bonus gives a lot of experience and it’s worth doing for leveling, but don’t neglect the gold gained either. Even poison flasks have value, and you can get half a stack in certain dungeons. Many of the above are actual gold making methods I use on a daily basis. They allow me to get good gear for my characters and buy style motifs and DLCs without having to reach for my mostly empty wallet. All of these ways to make gold do actually work, and it’s entirely up to you to find whatever method or combination you are comfortable using. What’s your gold making tip? Share it in the comments below. Published 84 days ago This entry was posted in Guides and tagged alchemy, blacksmithing, clothier, crafting, enchanting, equipment, gathering, gold, gold making, jewelry crafting, professions, provisioning, woodworking. Bookmark the permalink.